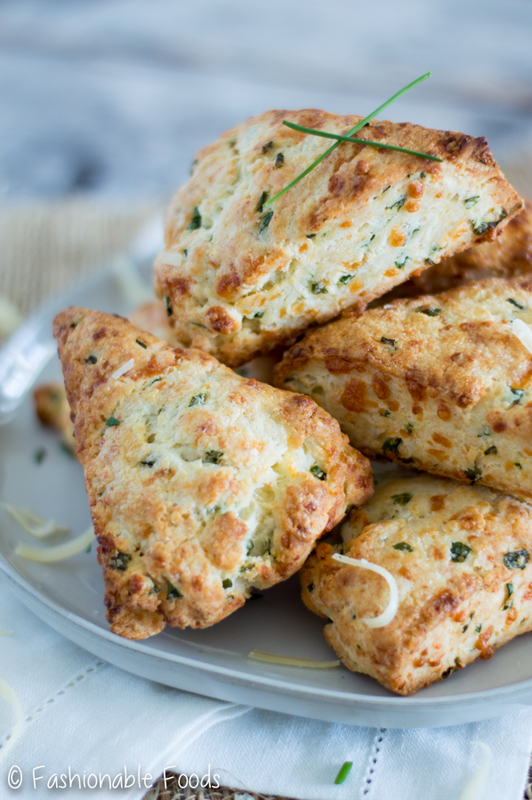 Sharp cheddar cheese and fresh chives are packed into buttery scones for the ultimate savory treat. 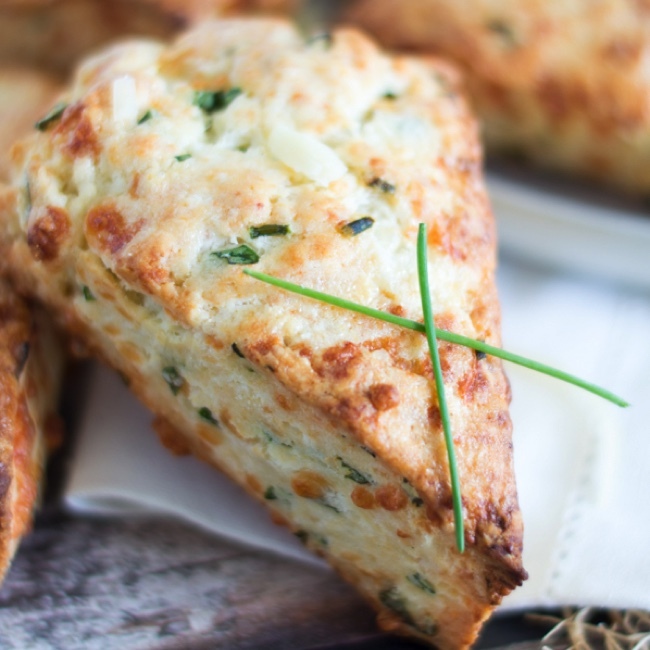 White cheddar chive scones will make any brunch extra special! Scones. You all know by now how much I love scones. I’ve said this before, but I really should have titled this blog scones and tacos. Both of those yummy things make up a good percentage of my recipes… but that’s not a bad thing. I don’t know about you, but I can never get enough scone recipes. There’s so much to love about them! You can make ’em sweet or savory and they are SO dang easy to make. 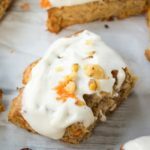 With spring technically here and Easter just a few days away, I’ve got brunch on the mind and scones are the perfect item for brunch! There’s nothing I love more than a warm, savory, buttery scone alongside my scrambled eggs. My idea of the perfect breakfast or brunch always includes a scone of some kind. 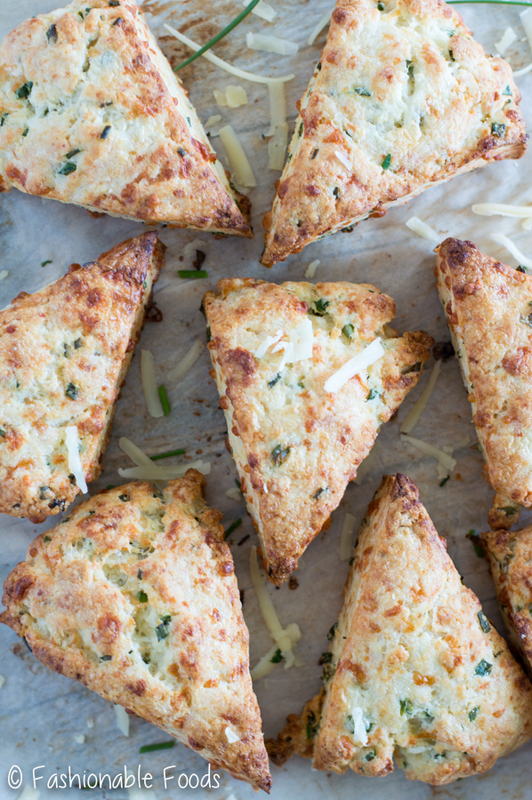 And these white cheddar chive scones are a new favorite. 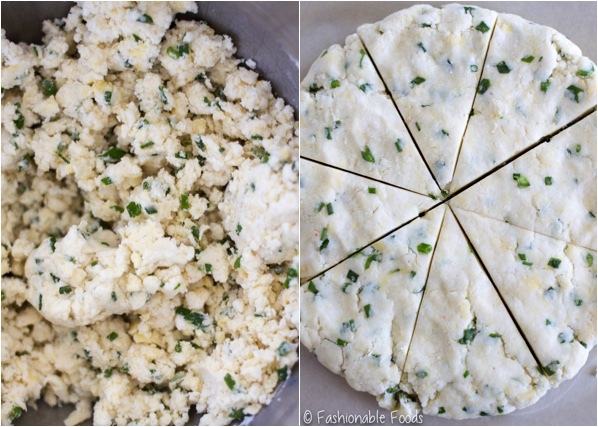 What’s not to love about cheddar cheese and chives? I’ve got chives growing nicely in my garden at the moment, so I knew I had to put them to good use. The great thing about scones is you can take a base recipe and switch up the mix-ins. Most of my scone recipes are pretty similar… sometimes more liquid is needed or sometimes less depending on what we are mixing in. Since cheddar cheese and chives don’t add much in the way of liquid, this particular recipe needed more liquid than some other recipe… like this lemon-blueberry one. For this recipe, I went with greek yogurt and heavy cream as my liquids. The Greek yogurt gives a nice tang and keeps the dough soft, while the heavy cream adds richness. Another great quality of scones is that they are super forgiving. If they seem dry, you can add more liquid and not mess them up. Same goes for if they are too wet and you need to add more flour. Plus, making them gluten-free is really easy and forgiving. 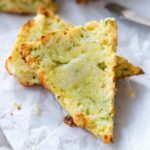 If you’re new to gluten-free baking, quick-breads like scones or muffins are a great place to start. As with most of my recipes, this one can be made with traditional wheat flour if you don’t need them gluten-free. Check out the recipe notes for directions! 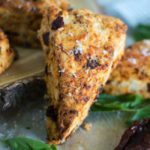 If you’re hosting Easter brunch these scones would be a perfect pairing to ham and scrambled eggs. Or, maybe you’re already planning a Mother’s Day brunch? 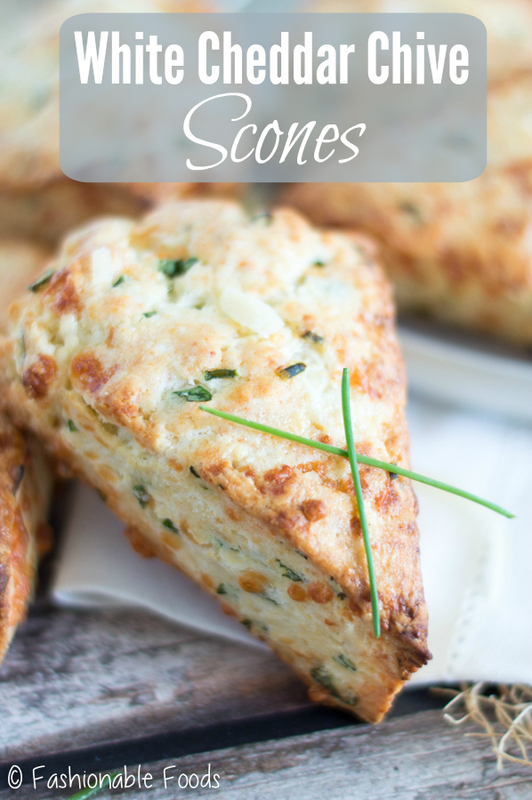 Either way, white cheddar chive scones are the perfect addition to your menu! 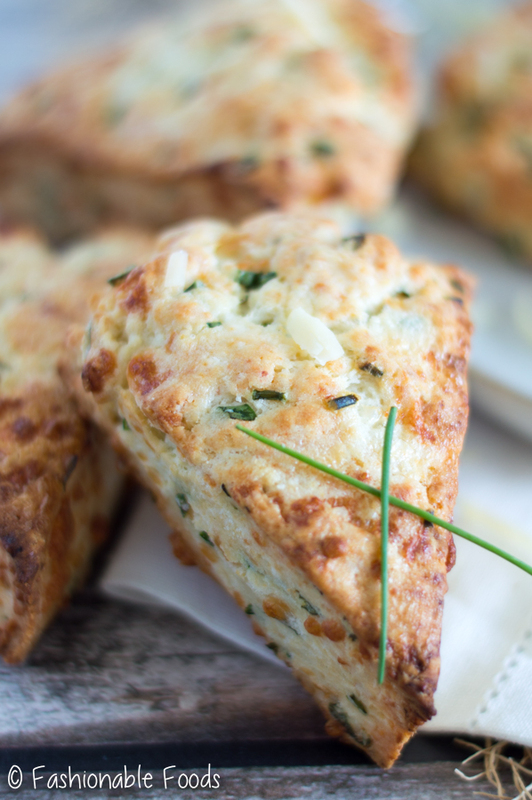 Sharp cheddar cheese and fresh chives are packed into buttery scones for the ultimate spring brunch. 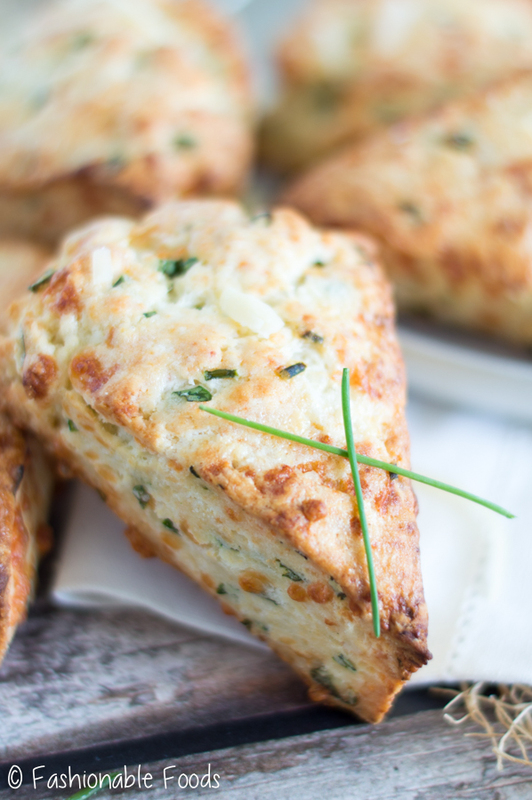 Savory white cheddar chive scones will make any brunch extra special! In the bowl of a stand mixer fitted with the paddle attachment combine the flour, xanthan gum if using, baking powder, sugar, and salt. Mix to combine. Add in the butter cubes with the mixer on low speed and allow the butter to “cut in”. The mixture will resemble coarse crumbs as the butter breaks down. Add in the cheese, chives, Greek yogurt, and heavy cream; mixing until just combined. If the dough hasn’t come together, add additional heavy cream 1 tablespoon at a time until the dough just comes together. Turn the dough out onto a parchment lined baking sheet and shape into a disk, about 1-inch thick. Cut the round into 8 slices and separate evenly on the baking sheet. Place the scones in the freezer while you preheat your oven. Once the oven is hot, remove the scones from the freezer and brush each with heavy cream. Bake the scones until golden brown, about 15-20 minutes. Scones are best served warm, but can be cooled and stored in an airtight container. *If you don't need these gluten-free, use 280 grams of all-purpose flour and omit the xanthan gum. If you don't have a scale, use 2¼ cups of the flour, adding an additional tablespoon or two if the dough is too wet. Made these tonight and they were wonderful. Had to use Dublinger cheese because someone ate my white cheddar. 🤨. Will be making them again soon. Thank you for the recipe. These were easy to make and yet so flavourful just little time needs to be ready. Definitely trying these again. Making these for dinner and lunch! Thanks for the recipe! Ashton Max recently posted … Best blender for ice and frozen fruit.